For this month's Secret Recipe Club I was assigned Fried Ice and Doughnut Holes written by Melissa. I love the name of her blog. The story behind it is her grandfather would tell them if they didn't behave they would get Fried Ice and Doughnut Holes for dinner...love it! I should try that with my boys but knowing my luck they would probably claim that Timbits are doughnut holes and actually try to make me fry ice! As I was browsing Melissa's blog I noticed we follow a lot of the same blogs. I already regularly make two of the dishes that are currently on her blog. They are Baked Southwestern Egg Rolls and Jalapeno Cheddar Burgers. They are both great recipes. I make the Jalapeno Cheddar Burgers quite often except I use 1 pound of chicken to intensify the flavours and a green chilli since I usually don't have jalapenos. It is an amazing recipe and you should definitely give it a try. The only reason I haven't posted it is because I just never have had a good opportunity to take a picture. After going through Melissa's recipes I decided to try Crispy Baked Zucchini Fries with Sriracha Lime Mayo. It turned out very well. I omitted the Parmesan so I increased that amount of salt. The Sriracha Lime Mayo was very spicy and we loved using it in sandwiches. But before I could take any pictures of the Zucchini Fries they were all gone. 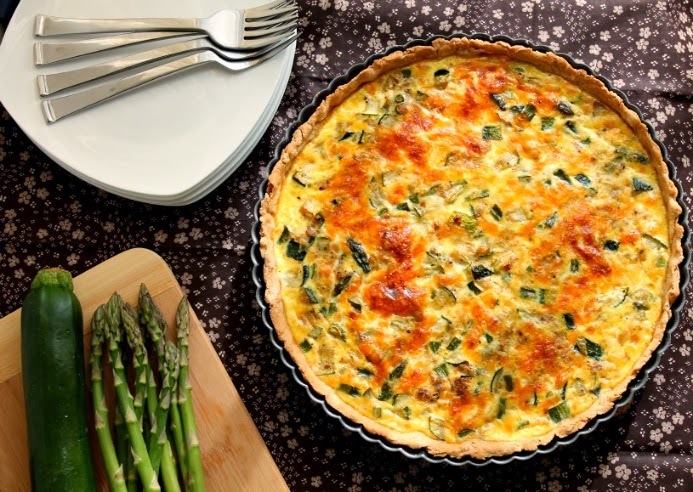 I didn't make it again because for me it was labour intensive and there were also other recipes from Melissa's blog I wanted to try like the Asparagus and Zucchini Quiche I have pictured above. Making quiche is something I don't do often. I have one recipe on my blog for a Spinach Quiche that we love. So I was excited to try out a new recipe. Melissa's recipe used a frozen pie crust. I used the one from my Spinach Quiche but used whole wheat pastry flour. I really enjoyed the quiche. The filling was softer than my Spinach Quiche which I think was due to the zucchini. Hasan didn't enjoy it due to the soft filling. Bilal thought it was great! While I was taking pictures he was constantly asking when he could have some. This quiche made a wonderful lunch that Bilal and I enjoyed. I've pinned some more recipes that I can't wait to try. Next is going to be Oatmeal Chocolate Chip Cookie Muffins which would make a great breakfast for the boys. Mixed Berry Baked Oatmeal and Veggie Enchiladas are also on the top of my list to make next! Please hop over to Fried Ice and Doughnut Holes and have a look at some of Melissa's great recipes! Preheat oven to 350 F. Prepare tart dough. You can find the recipe I used below or use a frozen pie crust. Heat olive oil in a large skillet. Add the onions, zucchini and asparagus. Cook for a few minutes. Add the garlic and cook until all vegetables are cooked. Add salt and black pepper. Take off the heat and set aside. In a bowl, whisk the eggs. Add the milk and cheese and whisk until blended. To the prepared tart dough, add the vegetables and spread to cover the bottom. Pour the egg mixture on top. Bake for 45 minutes. In a large bowl, using a fork mix together the flour and salt. Drizzle in the olive oil and mix with the fork. Add the cold water and mix until all the water is absorbed. Need a couple of times in the bowl until you get a ball. Transfer to a lightly floured surface and roll out. Carefully transfer to your tart pan and allow to rest in the fridge for 30 minutes. Can I please just tell you how amazing this picture looks? Looks fabulous, mA! This looks like a great way to get the kids to eat veggies... I've been making omelets for Zunoon lately and I sneak in whatever veggies I can. Something it's spinach, sometimes it's green peppers, etc. I've made quiche once before, but the filling was very set; I think I'll give this a shot iA! Thanks Henna! I've made that quiche that is on your blog before..The filling is much softer than that. All of us liked it except Hasan but I find he doesn't like things that have a soft texture. Like he doesn't eat egg salad sandwiches b/c of the texture. Hope Zunoon enjoys it! Let me know how it turns out! Guess who had your blog? Did you guess? Could you guess? YEAP, me! Loved cooking from your site, and your barley risotto was simply AWESOME! Have a wonderful Reveal Day! The quiche turned out gorgeous and elegant! Nicely done for SRC! What a great looking quiche. I recently made a spinach tomato and goat cheese one. Never thought to put zucchini and asparagus in one. Yum. Mmmm. Two of my favorite veggies. This looks amazing, and your photo is gorgeous! Absolutely gorgeous!! What a great SRC pick!! What an absolutely beautiful quiche. Fabulous photo too. What a perfect spring recipe! Can't wait til I have zucchinis in my garden again! I usually make quiche crustless (so more fritatta I guess!) but I'll definitely be trying your whole wheat and olive oil crust dough! Would have loved to see those fries! I love quiche...in fact I made two tonight...one for dinner and one for breakfast. great choice! Quiche is just the perfect meal! And with asparagus coming into the markets now, this is perfect! Great SRC pick this month! !